The Rockets took care of business Tuesday night, putting a shellacking on the 5-16 Sacramento Kings at Toyota Center. Before getting there, though, the Rockets’ starters were letting the Kings in the first quarter and part of the second slice through their interior defense to get lots of easy shots up close. The game was close until the end of the second quarter when the Rockets’ bench started a huge scoring run that went into the third quarter. When the starters came back, Houston opened up a 22-point lead and cruised to a 118-105 victory. It was a highlight reel of a game with all kinds of passes from Kyle Lowry (9 assists) to his teammates, with Luis Scola getting many of those passes on his way to 23 points, 14 coming in the 3rd quarter on 6-of-7 shots. Lowry-to-Scola is almost becoming like the new Stockton-to-Malone as far as Rockets’ history goes. Although Hakeem was in the house courtside Tuesday night, I don’t remember any point guard (Kenny Smith, Sam Cassell, etc.) during his Dream’s time as a Rocket feeding him the ball as much as Lowry has done for Scola lately. Probably the signature moment of the game was when Jordan Hill posterized Samuel Dalembert with a ferocious one-handed dunk that had a Phi Slama Jamma snap of a wrist to it. I had to watch that one several times over on my DVR. 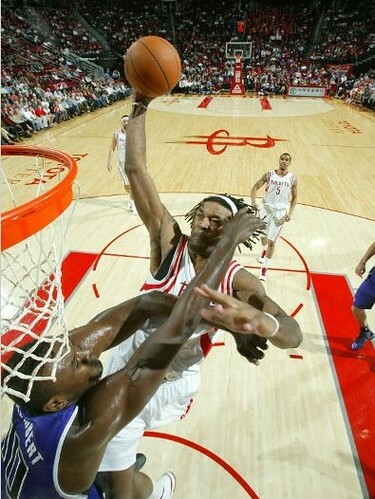 Jordan Hill throws one down over Samuel Dalembert. Click here for more photos from the game. When the season started, the bench that we all thought was impressive (on paper, at least) was really the difference in this game since the starters were sluggish in the first quarter. But Houston’s bench is far superior to Sacramento’s, so we have to take Tuesday’s dominance with a grain of salt. Interestingly, Jermaine Taylor didn’t play at all in garbage time. I didn’t expect he would since it’s been reported that Taylor will be traded to the Kings (coincidentally) for a 2011 second round pick (if Sacramento finishes with one of the top 5 records in the league, yeah, you heard me right) to make room for New Jersey’s Terrence Williams, who has been traded to Houston. So you can bet the Rockets weren’t going to do anything to risk Taylor to injury. But wouldn’t that have been wild if they had played him? Can you imagine the reaction that would have come from the Sacramento bench if they had played Taylor? I’m kind of bummed that Taylor won’t be able to show what all he can do in a Houston uniform. I’ve been high on him all season long, and when he did get some playing time, he showed just how much of a scorer and how athletic he is. I think it’s always a disappointment when the Rockets’ front office drafts a guy, they talk him up to get the fans excited, then we never really get to see them live out their potential before trading them. Now we have to get excited about Morris. Oh well, it was nice knowing you, JT. Just don’t come back and haunt us as the second coming of Michael Jordan. Now that the Rockets have redeemed themselves somewhat with wins over Cleveland and Sacramento after suffering that embarrassing loss in Milwaukee, Houston will have a chance to either let us down again with a stinker of a game on the road against an explosive Oklahoma City team, or get an unlikely ‘W’ like they did against the Lakers at home a couple of weeks ago. Which Rockets’ team will show up? Based on recent history, I’m not getting my hopes up. This entry was posted on Wednesday, December 15th, 2010 at 1:19 am	and is filed under vs. Sacramento. You can follow any responses to this entry through the RSS 2.0 feed. What is your opinion on Terrence Williams? Do you think he is going to be helpful to the team? I haven't read anywhere if Yao is playing or not. would say that it's a move worth taking despite his discipline problems. this year is pretty big money given his liabilities. Thanks, John, for your reply and take on TW's usefullness to the Rockets. Perhaps Adelman realizes that they should beef up on defence.